Here, I establish the main layout and gesture of this piglet's face. I'm striving for something that looks painterly, yet would bring a smile to the face of the viewer, so this stage is important. Also, color values on the pig are being set. Lots of changes from the halfway point, I added shadows in the hay and a little here and there. 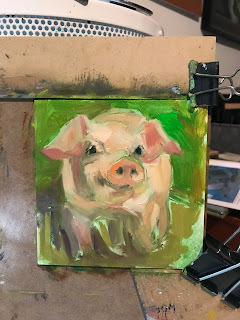 Mostly my painting style came out. 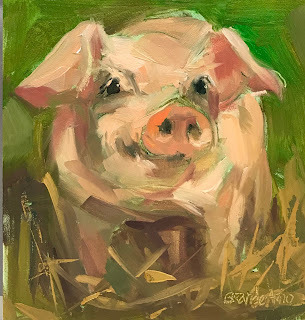 I'm also looking to apply broken color and using brushwork to describe the volume and length of the pig. I've painted this many times and every time I drive by the actual shack, I have to stop and look/take more pictures to work from. It's hard to admit that one smaller shack could inspire me so much. 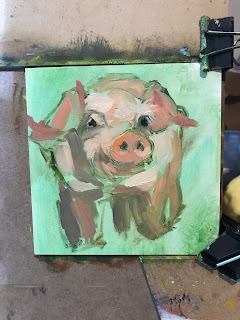 4 x 4 inches, Oil on Gessoboard - Click to Bid This piece was painted for the October Creatures of the Night, Nibblesfest Art Contest, or NFAC. The bidding starts at just .99 cents and is through ebay. Ends October 27. Good luck!